316 pages | 113 B/W Illus. 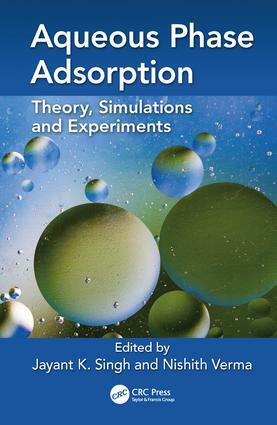 This book covers theoretical aspects of adsorption, followed by an introduction to molecular simulations and other numerical techniques that have become extremely useful as an engineering tool in recent times to understand the interplay of different mechanistic steps of adsorption. Further, the book provides brief experimental methodologies to use, test, and evaluate different types of adsorbents for water pollutants. Through different chapters contributed by accomplished researchers working in the broad area of adsorption, this book provides the necessary fundamental background required for an academician, industrial scientist or engineer to initiate studies in this area. Jayant Singh is a professor in the department of chemical engineering at IIT Kanpur. Dr. Singh 's current research interest is in material modeling, self assembly, energy storage, wetting transition, nanotribology and selective adsorption. Dr Singh has co-authored over 95 peer-reviewed articles in international journals of repute. He is a recipient of prestigious awards such as JSPS Invitation Fellowship, Alexander von Humboldt Research Fellowship, Young Engineers of Indian National Academy of Engineering, Amar Dye Chem Award of IIChE, BRNS Young Scientist Award and DST-BOYSCAST Fellowship. He is also an elected member of National Academy of Science, India. Dr. Singh is currently an associate editor of the journal Chemical Engineering Communications, and also serves on the editorial board of The Scientific World journal. Nishith Verma is a Professor of chemical engineering at the Indian Institute of Technology Kanpur, India. His research interests are the development of carbon-based materials, especially carbon nanofibers and nanoparticles in adsorption, catalytic reactions, biomedical, drug delivery, sensors, microbial fuel cells and agricultural applications. He has also developed lattice Boltzmann method-based mathematical models for adsorption and flow systems. Prof. Verma has published over 100 research articles in peer-reviewed international journals and has 8 Indian and US patents filed/granted. Prof. Verma is an Alexander Humboldt Fellow.